Wherever the open Tucson highway takes you and your vehicle, know that you have a towing service or mobile maintenance technician on call. That’s where Mobile Maintenance & Towing comes in. Safe commuters and truckers alike need a fast and reliable towing service on call whenever they find themselves stuck on the side of the road in Sonora desert with nowhere to go. At Mobile Maintenance & Towing, our 24-hour towing service works around the clock to keep you and your vehicles safe. Along with other services including roadside assistance and mobile maintenance, we also tow your car to our shop for more involved repairs. Any time, day or night, we’ll drive out to your vehicle and tow it into our shop for repairs. 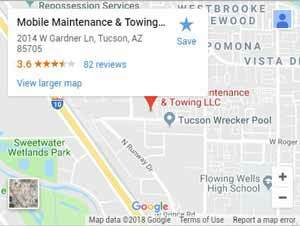 Our 24/7/365 tow trucks work fast, and offer dependable service built on a 10-year reputation of serving greater Tucson. Whether your car is broken down on the shoulder of the 10, or stuck in a flash flood, we’ll be there to help. MM&T technicians tow coupes, sedans, pick-up trucks, SUVs, and other passenger vehicles. Included in our towing services, we also do accident recovery, roll-over assistance, and winch-outs–especially during monsoon season. When smaller commercial vehicles break down, we have you covered with our heavy duty and super duty towing. When your heavy duty big rigs or trucks, we have heavy duty hauling capabilities for your big rig. We tow your truck to our shop, where we run diagnostics to see what’s going on under the hood. Along with standard towing across the board, we provide a variety of other roadside services and mobile fleet maintenance. We bring our tools and technicians to your garage for inspections that will keep your business running. Whether you drive a motorcycle or a big rig truck, you never know when fender-benders, breakdowns, or flash floods can leave you and your vehicle stranded on the shoulder. No driver or trucker wants to be slowed down by a fender bender or break down. And nobody likes waiting on the shoulder of a busy road in the scorching Tucson sun for a tow truck to finally appear out of the desert like a mirage.